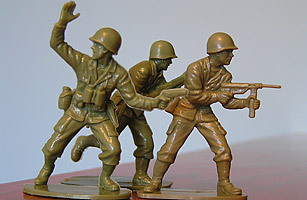 In 1938, the Bergen Toy and Novelty Co. began selling an inexpensive line of minuscule, monochrome plastic soldiers. The 2-in. American figures were produced in U.S. Army green and molded in a variety of action poses  a little boy's war fantasy come true. Sold in large plastic bags, demand for the little green men rose in the 1950s thanks to a boom in plastics manufacturing and a lead-poisoning scare that made the metal versions less appealing. Soon the company was manufacturing enemy forces too: German troops were molded in grey, Japanese forces in yellow. Though the little warriors have undergone several changes over the years, their most famous identity is as World War IIera soldiers with "pod feet" attached to keep them standing during battle.